LONDON--(BUSINESS WIRE)--Technavio projects the global polyvinyl butyral market to post a CAGR of more than 6% during the forecast period. The increased demand for polyvinyl butyral films is a key driver, which is expected to positively impact market growth during the period 2018-2022. Polyvinyl butyral films used in laminated glass act as a protective interlayer by strongly bonding two panels of glass under high heat and pressure. This treatment renders optical transparency to the interlayer, rendering the panels as a single glass unit. The polymer in the polyvinyl butyral film is tough, strong, and ductile, thereby preventing cracks. Also, polyvinyl butyral films have been widely adopted in manufacturing photovoltaic thin-film solar modules due to their excellent properties. They encapsulate the circuit and protect it from environmental damage. Thus, the increased demand for films and sheets in the automotive sector and other end-user industries can create more growth opportunities for the global polyvinyl butyral market. The photovoltaic effect is a phenomenon involving the conversion of light energy into electricity using semiconductors. For instance, a solar cell absorbs sunlight and converts it into electricity. The solar photovoltaics industry is experiencing increased installation capacity over the years, which will result in reduced greenhouse gas emissions as well as a reduction in the release of harmful pollutants. Solar panels are used for both residential and industrial applications. Polyvinyl butyral is used as an encapsulation material for solar cells and graphene batteries due to its excellent thermal properties such as thermal and ionic conductivity. “The global energy statistics of 2017 reveal that a major portion of the electricity was produced from non-renewable sources. However, the global renewable energy market share is expected to increase from 12% in 2015 to 15% by 2022, which augurs well for the solar photovoltaics industry. This will lead to an increase in demand for polyvinyl butyral during the forecast period,” says a senior analyst for plastics, polymers, and elastomers research at Technavio. This market research report segments the global polyvinyl butyral market based on application (films and sheets, paints and coatings, adhesives, and others) and key regions (the Americas, APAC, and EMEA). The films and sheets segment held more than 87% share of the market in 2017, followed by the paints and coatings and adhesives segment respectively. In 2017, the global polyvinyl butyral market was led by APAC which accounted for more than 40% share followed by the Americas and EMEA respectively. APAC is also expected to witness the maximum growth in its market share over the forecast period. 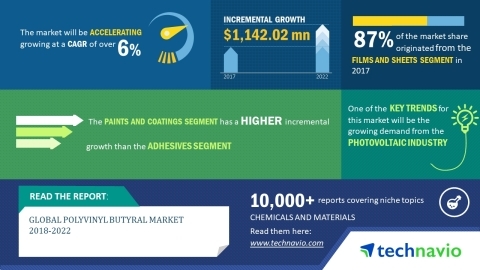 Technavio projects the global polyvinyl butyral market to post a CAGR of more than 6% during the forecast period, 2018-2022.